The nest patrol activity was finished last mont. That five months nest patrol was successfully secured 424 eggs of 26 nests. Of that total number, 371 eggs was hatched while the other was failed. This year hatching rate is 87.5 percent, higher compared to last year. The hachlings produced this year is 371. All hatchlings produced are released immediately after hatched. So, as of 2017, the total hatchlings of Painted Terrapin (Batagur borneoensis) released into wild is 1,204. We are expecting this number will boost the wild population of this critically endangered terrapin in the future. Totally, we spent 131 days on the beach to carry out nest patrol. We were walking along the beach, about 3.2 km in length. So, we had to walk along 6.4 km every night, three hours per night and depend on the time of high tide. There was also a time when we had to walk two times every night: 7 pm and 5 am. That was happened when the high tide occurred early night (about 7 pm). Then, the high tide was started again at about 5 am. So, we had two chances that Painted Terrapin females would be emerged to the beach and nesting. We secured 92 eggs of 5 nests on December 2016. On January, 259 eggs of 16 nests. In March, we found and secured 73 eggs of 5 nests. All eggs found were incubated on hatchery was built on the beach. During nest patrol, we were also measured the daily air temperature and humidity, sands (surface and 10 cm under the surface) temperature. The measurement of temperature and humidity was conducted manually four times per day: 4 am, 10 am, 4 pm and 10 pm. The temperature and humidity on the beach is very volatile, therefore by doing this, the average value is more represented. In addition, we found and marked 3 females on the beach. All are new individuals, not marked before. If we try to compare the result of this year nest patrol with last year, the total number of eggs and nests found and secured is declining sharply. Last year, our nest patrol was successfully secured 910 eggs of 51 nests. The decreasing is about fifty percent. There are, at least, three reasons behind this declining. First is beach erosion. 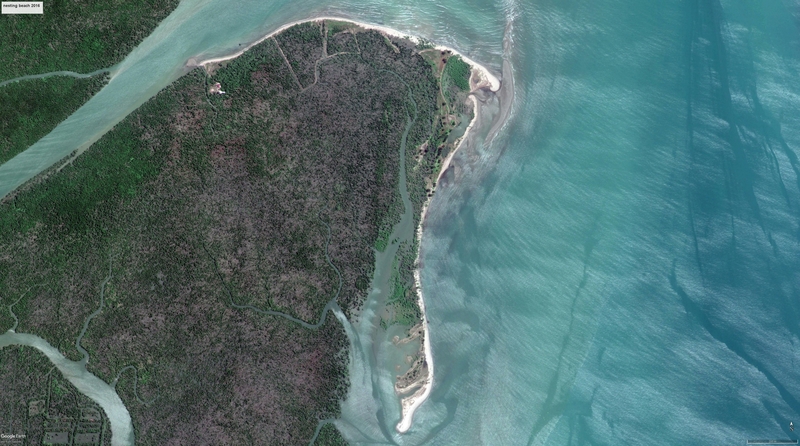 The erosion has caused about half of the nesting area lost. The place where we found about half of total nest secured last year, currently is lost. The second reason is the massive trash on the beach. It produces obstacle for female to reach the higher area on the beach for nesting. Third reason is shrimp traps. Fishermen who met with us said to us that some terrapins die because trapped in this traps. This kind of trap is used by fishermen to catch the shrimp. The traps are laid in riverbed. Banana and coconut are used as bait. Unfortunately, this bait is favorite for terrapin. We always use this bait in our capture-recaptured survey. Fishermen are checking that traps after some hours. Therefore, once the terrapin caught by that traps, it is impossible for them to taking air and breathe. We found two females corpse that become victim of this trap. Do the hatchlings survive after released? Of course, the question that lie in our mind is do they survive in wild after released?. This question is also in our mind. Therefore, efforts to get evidence to answer this question have been being conducted in the field and in progress. 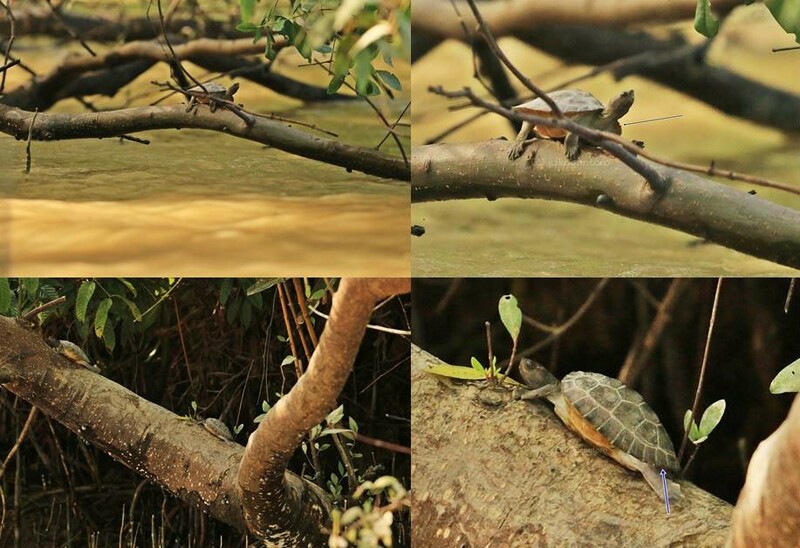 Although it is confirmed by some accidental sightings that the post-released hatchlings – indicated by mark on marginal carapace – are basking on logs at riverside, thus can be an indicator that they are successfully survive in rivers, but that is not sufficient. More surveys are necessary. This is not only to answer that question, but is also to be a tool for evaluation of our conservation method. Recent years, the findings of post-released hatchlings basking on logs are common for fishermen. Fishermen who usually ride their boat are common sighting the hathclings on some particular place (riverside). They said that was not common in previous years. In our trip from village to nest patrol camp and vice versa were also successfully observed that hatchlings. Even, we were able to see their mark on marginal carapace, although we could not identify their number precisely. The latest releasing we did was on 1 December 2016. The sub-juvenile on picture 4 was photographed on 12 March. The location of we photographed that sub-juvenile is about 3 km from releasing site on December 2016. So, perhaps, they are the sub-juvenile was released on December 2016. This can be a positive sign that the nest patrol and headstarting method is successful to recover sub-juvenile population. For wild adult population, it must be looked at long term, at least four to eight years later. 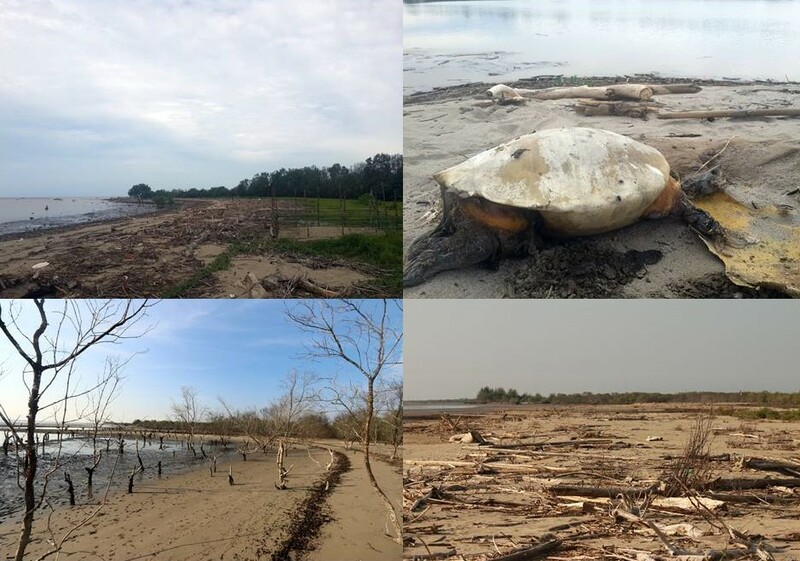 We would like to thanks to our partner Turtle Survival Alliance, Houston Zoo and Chester Zoo who supporting our works to conserve Painted Terrapin.